The problem is tricky though. Sometimes the older child needs adult help to keep a little space of his own, but having an adult step in to solve a childs problem doesnt make a good story. The child needs to come up with his own solution. How can he do that without being mean or bossy or tattling? He has to be very clever. Sometimes the younger sibling can be aware of the situation and be making mischief on purpose...Hmmm? Not a bad idea. Ill have to think about that some more... But for this story I decided to have a little sister who isnt being the least bit naughty, just a little overly enthusiastic about doing whatever her big brother is doing. Daddy tries to help, but Lucy gets upset. Sam is a nice big brother; he doesnt want Lucy to be upset. But he does want to make his own drawing, so he figures out a way to get her out of the way for awhile by giving her something she wants...and needs. My editor questioned the whereabouts of Mommy, but I thought Id leave that to the reader to decide. The illustrations were drawn from my family photo albums and memories of young children. Unfortunately, at the time I didnt know any children who were the right ages and sizes to pose for these pictures. Besides, some shots would have been difficult to pose. I wouldnt have wanted to make a baby scream and kick just so I could take her picture. Fortunately, I have taken quite a few pictures of my own three daughters, and fourteen nieces and nephews over the years. 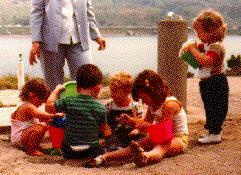 The photograph shown here is of my youngest daughter, Lassen, and the four cousins who are very close to her in age. Lassen is the one standing. Shes one and a half years old. The oldest girl is three. These kids are all teenagers now. My art director liked the energy in the sketches I first showed her, especially the one here of Lucy throwing the tantrum. I thought I might like to try doing the illustrations in a medium that would let me keep that energy, felt markers perhaps, which I had used for underpainting behind the colored pencil work in several previous books. But my editor and art director wanted me to try for the softness of line and palette that I had used in Its Just Me, Emily. They liked the delicacy, simplicity, and cozy homey atmosphere of that book and thought it was what this book needed as well. I think they were right. When Sam carefully constructs a tunnel in the sandbox, his little sister Lucy "helps" by putting more sand on top, causing a cave-in catastrophe. Indoors, Lucy adds a block to Sam's tower. It collapses. Frustrated but not beaten, Sam pulls Lucy in her wagon until she falls asleep, leaving him free to draw a picture without any unwanted help. The line-and-watercolor illustrations capture the body language as well as the concerns of both preschooler and toddler as Hines once again mirrors the young child's world in a simple, attractive picture book. Ages 3-6. 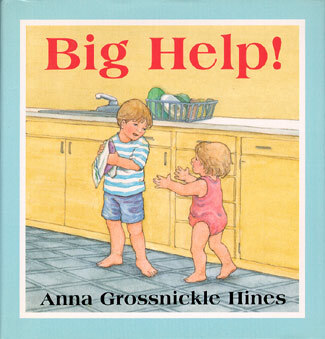 Sam's well-intentioned little sister, Lucy, tries to help him in a toddler's inimitable, clumsy style. In a mature and thoughtful manner, Sam distracts Lucy and diffuses their sibling tension. The small square book, illustrated with realistic colored-pencil and watercolor illustrations in pastel tones, merely offers a bland story with little imagination for preschoolers. Horn Book Copyright © 1995 The Horn Book, Inc. All rights reserved.